This tree cricket was hiding within a curled leaf. Wundanyi, Taita Hills, May 2017. Length, excluding the antennae, is about 8 mm. 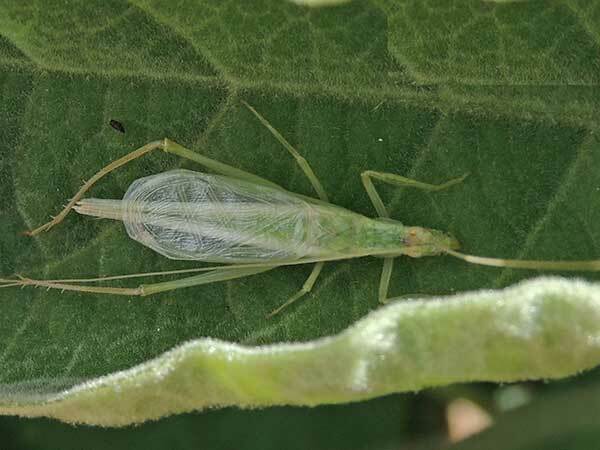 Tree crickets hide by day on the undersides of leaves or stems. This hiding behavior is strongly related to the pattern of camouflage, i.e. the specific location and even the plant species matches the insect's. By and large they feed almost exclusively by night on leaves and flowers. The males also call at night by rubbing their wings together. Each species has a unique song signature. Copyright Michael J. Plagens, page created 30 Aug. 2017.